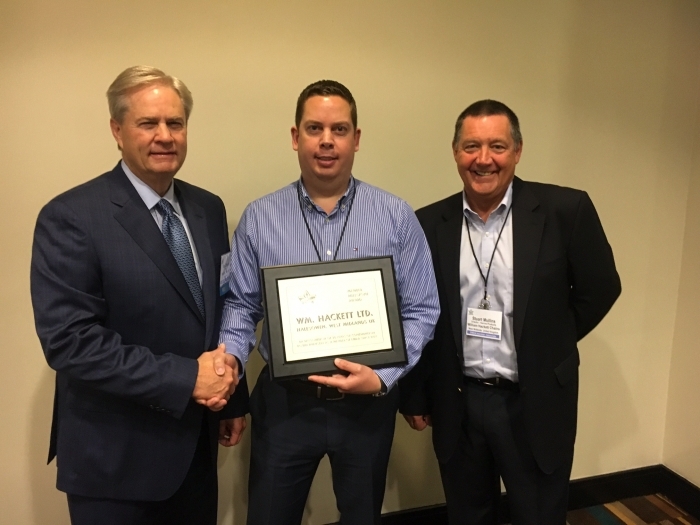 William Hackett has recently been awarded a Member Milestone Award from the American based Equipment Marketing and Distribution Association (EMDA). The EMDA Convention was held 7th-9th November at the Hyatt Regency, Houston. 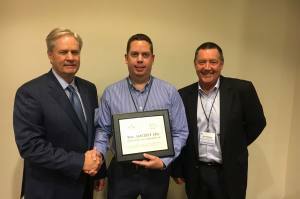 Pictured (left to right) is Ron Chandler, President of EMDA presenting the award to Ian Kelly (Operations Director) and Stuart Mullins (Director - Harrow Products) of William Hackett. The Equipment Marketing & Distribution Association (EMDA) is the international association for wholesaler-distributors and manufacturer’s representatives of agricultural and related industry equipment and parts. For generations, EMDA members have served as the vital link between manufacturers and North American retail dealers. EMDA’s member reps and distributors are located throughout the United States and Canada. They perform such value-added services as warehousing, in-field sales representation, advertising and promotion, product education, service requirements, warranty representation, physical handling and credit and collections. EMDA members provide the functions which lower the total cost of distribution and increase manufacturers' market share.